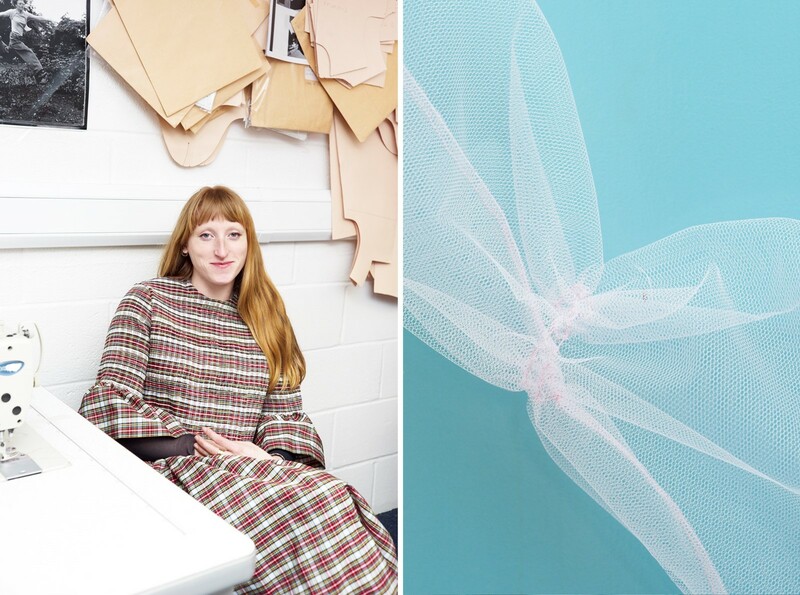 Molly Goddard’s London studio space sits just underneath the Westway, in an old school that has recently been transformed into a series of workrooms. On the day that I arrive to rifle through her A/W16 collection, there is a primary school pottery class going on next door and someone, somewhere, is playing guitar quite loudly. “I can’t believe there are kids just running around,” she says, embarrassed. “Plus, everyone else seems to have redecorated their space and we haven’t. But as soon as we got this, we just needed to move right in and get going on the collection.” Thus, her slightly bizarre classroom-come-HQ has all the décor of, well, a primary school, complete with those synthetic blue carpets that you never see outside of one – but somehow, it all makes sense with her the subversion of childhood that marks her aesthetic. Goddard's arrival in this space is a new evolution: only a few months ago, she was creating her collections in her mum’s spare room – a space roughly the size of one of the landings we descend down before reaching a room filled with young girls and whirring sewing machines. She is nothing if not resourceful: as we speak, she is still creating her collection, her mother and father are constructing her new showspace at the Tate Britain, her boyfriend is doing all the accounts and her sister Alice is looking after casting and styling. She and her studio still handmake all of her pieces – even the labour-intensive smocking is still done in this little space. Goddard's first show (A/W14, a season before she appeared on the official schedule) employed her friends to stage a tea-party while dressed in her creations – it was brilliantly intimate and a bit weird and set the tone for subsequent seasons, but its design was borne of necessity rather than careful planning: essentially, she couldn’t afford to cast models and the whole thing only cost a few hundred pounds to put on. 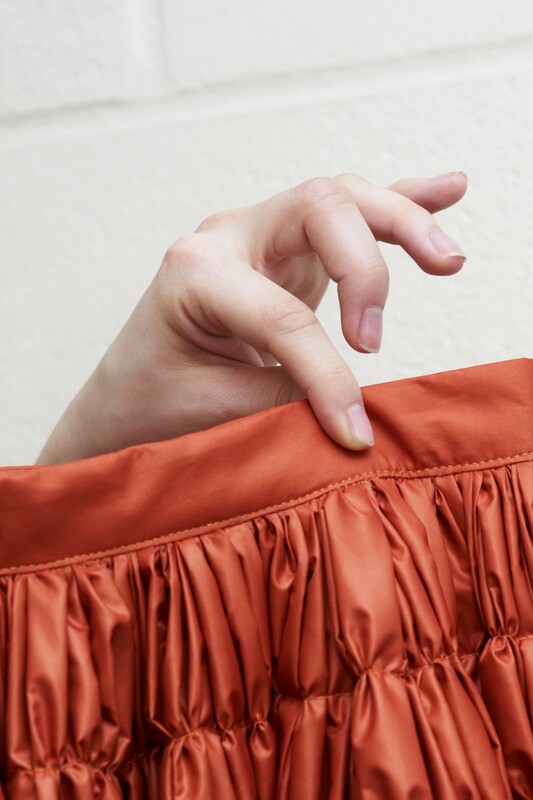 Funnily enough, last season seemed to riff on this idea – Goddard’s S/S16 presentation at the ICA was set up like a factory, with depressed-looking, stringy-haired girls dressed in tulle and tartan making ham salad sandwiches. It took the collection away from becoming the Disneyland fantasy that it could easily have been, and into the domain of something slightly sinister: it all looked a bit like an abattoir. Such subversion is key to Goddard’s aesthetic – while her creations are often the stuff of little-girl dreams, there is something else to them that makes them so fabulous, something unnerving and perfectly wrong. The pieces are always a little bit big (“I just like ill-fitting things”) or made of a weird fabric (for A/W16, poly-taffeta or a plasticky anorak material that is slightly suffering under the sewing machine needle), maybe in a slightly gross colour. It steers her princess dresses away from the saccharine (“that would repulse me,” she says) and into the distinctly grown up – something that A/W16 has achieved with impressive grace. It's less Harajuku Girl and more Lynn Yaeger (she calls Molly her "spiritual god-daughter"). While this might initially sound alienating for those of us not au fait with a needle and thread, it’s the same principle that has guided Comme des Garçons over the past six seasons to resounding success – Rei Kawakubo has recently eschewed conventional runways in favour of a kind of magical, moving exhibition from which the rest of the collection (only seen at the showroom) takes inspiration; both are available to purchase, but one clearly produced in larger quantities. In fact, Kawakubo has been an advocate of Goddard’s since she started out, inviting her into the family of designers housed at DSM – and Molly Goddard will have a permanent home in their new Haymarket store. So, what does the famously cryptic designer have to say about it all? “She said that she liked the tartan dresses and that I should make more," grins Goddard. "But I haven't.... maybe I'll do some for Haymarket." And that's what makes Goddard just so good: a complete and utter rejection of all the things you'd assume a young designer ought be focused on, from Kawakubo's instruction to profit margins, a resolute refusal to make a pair of trousers and just to stick to her guns (although this collection features a coat, very practical). That, and her fantastical clothes, of course.